Turipo - 4 days in Barcelona. 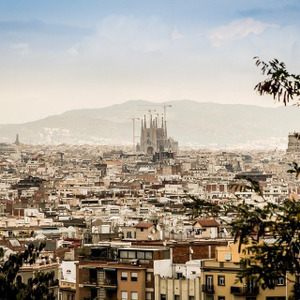 4 days travel itinerary in Barcelona, the best things to do in Barcelona:The Park Güell, Mercado de La Boqueria, Picasso Museum, La Sagrada Familia and more attractions in Barcelona. 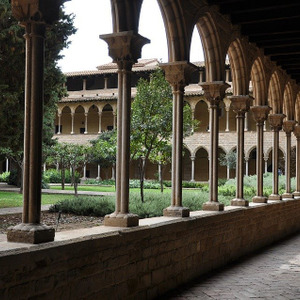 Description: 4 days travel itinerary in Barcelona, the best things to do in Barcelona:The Park Güell, Mercado de La Boqueria, Picasso Museum, La Sagrada Familia and more attractions in Barcelona. The Park Güellis a public park system composed of gardens and architectonic elements located on Carmel Hill, in Barcelona, Catalonia. Carmel Hill belongs to the mountain range of Collserola – the Parc del Carmel is located on the northern face. 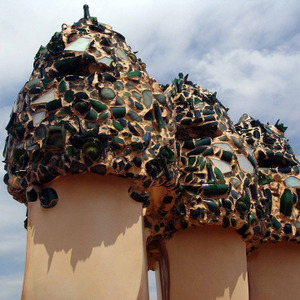 Park Güell is located in La Salut, a neighborhood in more.. the Gràcia district of Barcelona. With urbanization in mind, Eusebi Güell assigned the design of the park to Antoni Gaudí, a renowned architect and the face of Catalan modernism. The park was built between 1900 and 1914 and was officially opened as a public park in 1926. 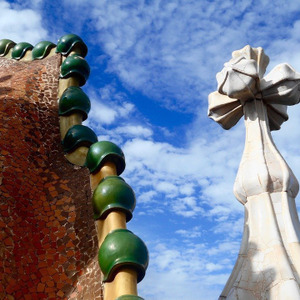 In 1984, UNESCO declared the park a World Heritage Site under "Works of Antoni Gaudí". less..
El Ravalis a neighbourhood in the Ciutat Vella district of Barcelona, Catalonia, Spain. 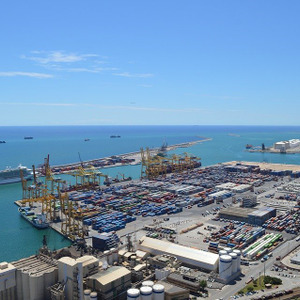 The area, especially the part closest to the port, was also informally known as Barri Xinès or Barrio Chino, meaning "Chinatown". 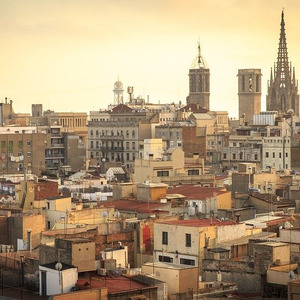 El Raval is one of the two historical neighborhoods that border La Rambla, the more.. other being the Barri Gòtic, and contains some 50,000 people. 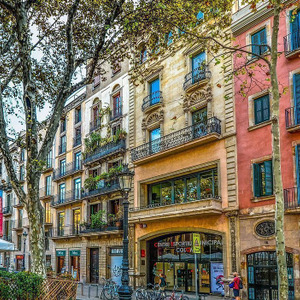 An area historically infamous for its nightlife and cabarets, as well as prostitution and crime, El Raval has changed significantly in recent years and due to its central location has become a minor attraction of Barcelona. 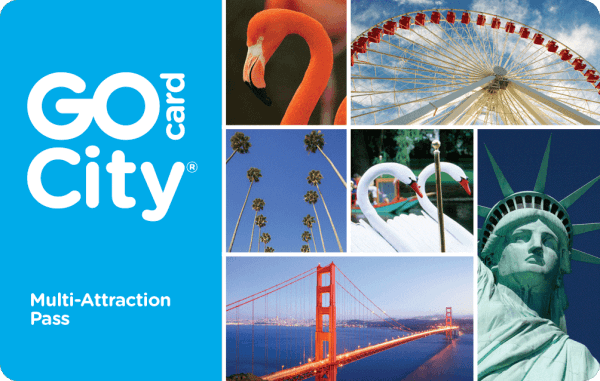 It currently has a very diverse immigrant community. It is home to many bars, restaurants, and night spots. less.. The Gothic Quarteris the centre of the old city of Barcelona. It stretches from La Rambla to Via Laietana, and from the Mediterranean seafront to the Ronda de Sant Pere. It is a part of Ciutat Vella district. 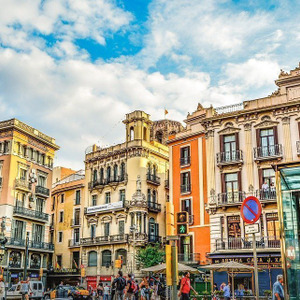 The quarter encompasses the oldest parts of the city of Barcelona, and includes the remains more.. of the city's Roman wall and several notable medieval landmarks. Much of the present-day fabric of the quarter, however, dates to the 19th and early 20th centuries. El Call, the medieval Jewish quarter, is located within this area, along with the former Sinagoga Major. 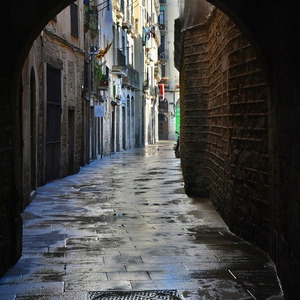 The Barri Gòtic retains a labyrinthine street plan, with many small streets opening out into squares. Most of the quarter is closed to regular traffic although open to service vehicles and taxis. less..
A number of museums are devoted to the Spanish artist Pablo Picasso. In France Musée Picasso, Antibes, France Musée Picasso, Paris, France Musée Picasso, Vallauris, France In Germany Kunstmuseum Pablo Picasso Münster, Münster, Germany In Spain Museu Picasso, Barcelona, Spain Museo Picasso de more.. Buitrago, Buitrago del Lozoya, Spain Fundación Picasso, Málaga, Spain Museo Picasso Málaga, Málaga, Spain less..
Museu de la Xocolatais a private museum in Barcelona, Catalonia, Spain, owned by the Gremi de Pastisseria de Barcelona. The museum opened in 2000, at Carrer Comerç 36, in El Born, Ciutat Vella, on the ground level of an old barracks. Many of the displays are chocolate sculptures, including various more.. well-known Barcelona buildings, and illustrations from various stories. less.. The Basílica i Temple Expiatori de la Sagrada Famíliais a large unfinished Roman Catholic church in Barcelona, designed by Catalan architect Antoni Gaudí. Gaudí's work on the building is part of a UNESCO World Heritage Site, and in November 2010 Pope Benedict XVI consecrated and proclaimed it a more.. minor basilica, as distinct from a cathedral, which must be the seat of a bishop. In 1882 construction of Sagrada Família commenced under architect Francisco Paula de Villar until 1883, when Gaudí became involved when Francisco resigned as the head architect. 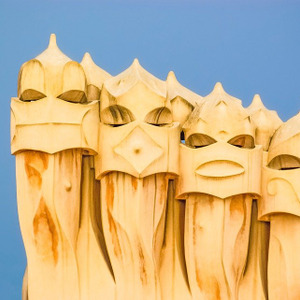 Taking over the project, Gaudí transformed it with his architectural and engineering style, combining Gothic and curvilinear Art Nouveau forms. Gaudí devoted his last years to the project, and at the time of his death at age 73 in 1926, less than a quarter of the project was complete. Sagrada Familia's construction progressed slowly, as it relied on private donations and was interrupted by the Spanish Civil War, only to resume intermittent progress in the 1950s. 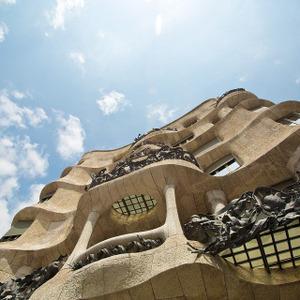 Construction passed the midpoint in 2010 with some of the project's greatest challenges remaining and an anticipated completion date of 2026, the centenary of Gaudí's death. The basílica has a long history of dividing the citizens of Barcelona: over the initial possibility it might compete with Barcelona's cathedral, over Gaudí's design itself, over the possibility that work after Gaudí's death disregarded his design, and the 2007 proposal to build an underground tunnel of Spain's high-speed rail link to France which could disturb its stability. Describing Sagrada Família, art critic Rainer Zerbst said, "It is probably impossible to find a church building anything like it in the entire history of art" and Paul Goldberger describes it as, "The most extraordinary personal interpretation of Gothic architecture since the Middle Ages." 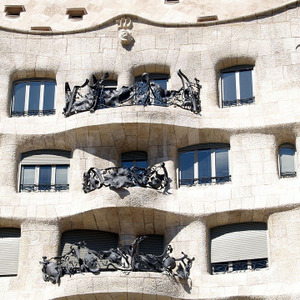 less..
Casa Batllóis a renowned building located in the center of Barcelona and is one of Antoni Gaudí’s masterpieces. A remodel of a previously built house, it was redesigned in 1904 by Gaudí and has been refurbished several times after that. Gaudí's assistants Domènec Sugrañes i Gras, Josep Canaleta and more.. Joan Rubió also contributed to the renovation project. 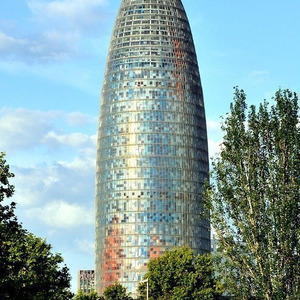 The local name for the building is Casa dels ossos, as it has a visceral, skeletal organic quality. Like everything Gaudí designed, it is only identifiable as Modernisme or Art Nouveau in the broadest sense. The ground floor, in particular, has unusual tracery, irregular oval windows and flowing sculpted stone work. There are few straight lines, and much of the façade is decorated with a colorful mosaic made of broken ceramic tiles. The roof is arched and was likened to the back of a dragon or dinosaur. A common theory about the building is that the rounded feature to the left of centre, terminating at the top in a turret and cross, represents the lance of Saint George, which has been plunged into the back of the dragon. less..
Santa Maria de Montserratis a Benedictine abbey located on the mountain of Montserrat, in Monistrol de Montserrat, in Catalonia, Spain. It is notable for enshrining the image of the Virgin of Montserrat. The monastery was founded in the 10th century and still functions to this day, with over 150 more.. monks. less..
Aquarium Barcelonais an aquarium located in Port Vell, a harbor in Barcelona, Catalonia, Spain. 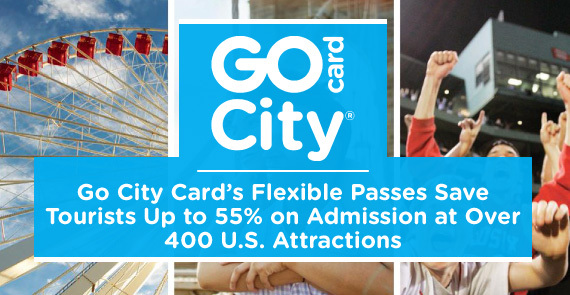 The 35 aquariums at the facility are home to 11,000 animals representing 450 species. The aquarium contains a total of 5,000,000 l. This includes an ocean tank for sharks, rays and other large fish, which more.. is 36 min diameter, 5 mdeep, contains 3,700,000 lof water and has a 80-meterunderwater tunnel. The Aquarium of Barcelona is part of the Aspro Parks. The aquarium is a member of the Iberian Association of Zoos and Aquaria. less..
Montjuïc Castleis an old military fortress, with roots dating back from 1640, built on top of Montjuïc hill in Barcelona, Catalonia, Spain. It currently serves as a Barcelona municipal facility. The Fundació Joan Miró, Centre d'Estudis d'Art Contemporaniis a museum of modern art honoring Joan Miró located on the hill called Montjuïc in Barcelona, Catalonia.